When the Triennale is in session, ferry pass holders can travel freely for 3 consecutive days on any ferry joining 5 of the 12 islands participating in the Triennale. Once the ferry pass has been purchased (or exchanged for a voucher), there is no need to line up at the ferry counter to purchase tickets before boarding. Advance discount price offered until April 25, 2019. Regular: 2,200 yen; Child: 1,100 yen. Purchasers will be given vouchers to exchange for 3-Day Ferry Passes on site. 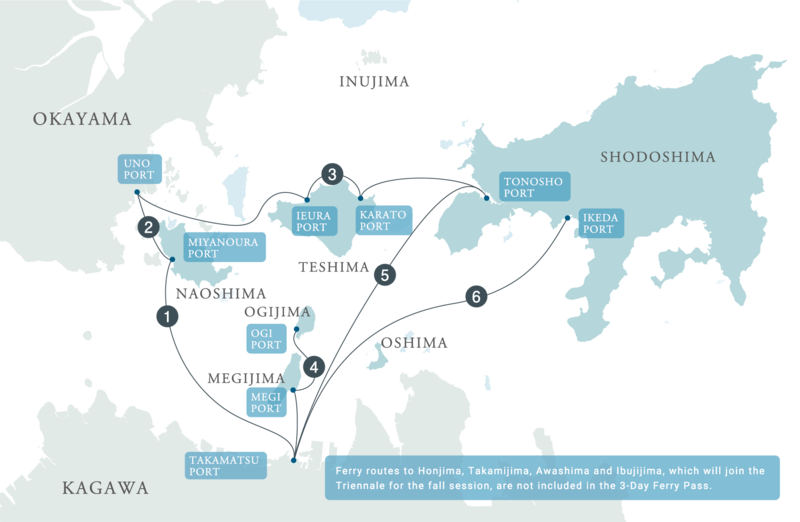 Ferry routes to Honjima, Takamijima, Awashima and Ibujijima, which will join the Triennale for the fall session, are not included in the 3-Day Ferry Pass. 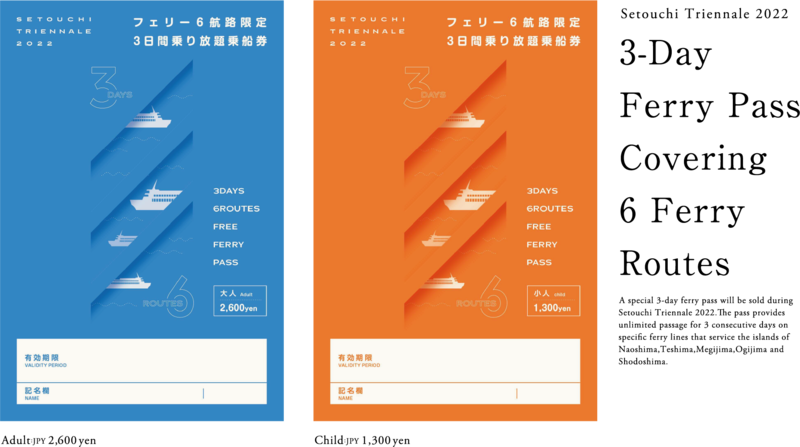 Please note that 3-Day Ferry Passes can only be purchased or exchanged for vouchers when the Setouchi Triennale is in session. 1. The 3-Day Ferry Pass can be used unlimited times while valid only on designated ferries. 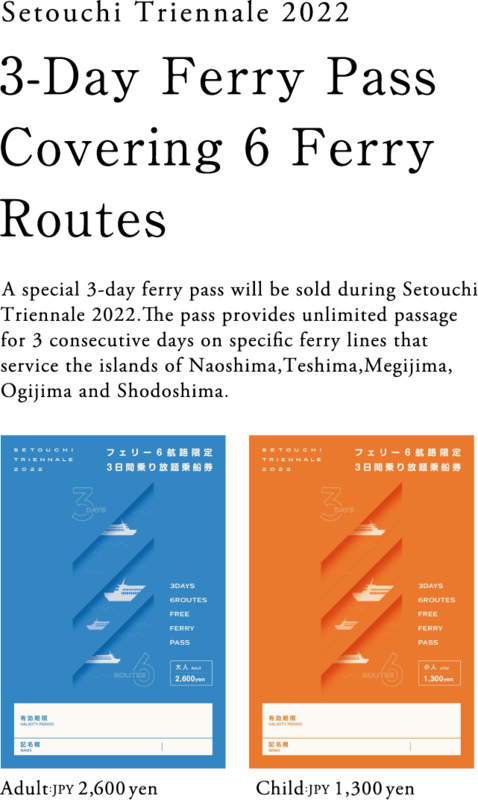 ･The pass can be used only while the Triennale is in session (see the back of the pass for the dates) for 3 consecutive days beginning from the day of direct purchase or exchange of the voucher. Use of the pass cannot be extended from one Triennale session to another. ･The pass can only be used by one person. ･Pass holders will be charged separately for any motorcycle, bicycle or vehicle they bring onto the ferry. 2. Please show your pass to the ferry staff each time you board. ･Line up in the same place where passengers with regular tickets line up to board. During crowded periods, some ferries may also require a numbered queue ticket. ･Pass holders cannot board once the boat is full. ･Pass holders cannot reserve or make group reservations for ferries. 3. Please write your name on your pass. ･No refunds or reissuing of ferry passes is possible even if the passes are lost, stolen, destroyed, etc. ･The passes may not be transferred to another person, whether for free or for a price. If any such misdemeanor is discovered, the ferry pass will be deemed invalid and confiscated. ･Ferries may be cancelled due to poor weather conditions. ･For each day that a ferry is cancelled, the pass will be extended one day. However, this will not apply if the ferry is cancelled after twelve noon. ･Please present your pass at the ticket counter of the ferry that was cancelled.